The following article was published in the summer, 1995 Dulcimer Players News. It may not be reproduced (except for individual, one–time use) or reprinted without permission. “I want you to know I’m not going to be compulsive about this,” Phil said as he settled himself into a chair and propped the hammer dulcimer across his knees. Phil Passen, my husband, has wanted to play a musical instrument ever since I’ve known him. Except for a two–month stint with the coronet when he was in third grade, he has never played an instrument or taken a class in musical history, training, or theory. But we’ve always enjoyed music, particularly Appalachian and Celtic. What prevented Phil from taking up a musical instrument was work. Like many people, we both work long hours Ñ Phil in the printing business, I as a freelance writer. So although he always wanted to play, Phil worried he’d have no time to practice. In June of 1994, though, he decided to take advantage of the Old Town School of Folk Music here in Chicago. With each yearly membership renewal, we can choose to have a free half–hour music lesson. After attending a John McCutcheon concert at the Old Town School, Phil decided he would take his free half–hour lesson on the hammer dulcimer. Dona Benkert, who teaches both at Old Town and at the Warrenville Folk Center, gave Phil his free lesson. When he expressed concern about having so little time, she assured him that if he could practice from 15–30 minutes a day, every day, he would make progress and enjoy the music. Excited, but still unsure whether things would work out, Phil went to Hog Eye Music in Evanston and rented a Dusty Strings Apprentice Model hammer dulcimer for $45 a month, with the first four months of rent applying to the $545 purchase price if he should decide to buy the instrument. He also signed up to take classes from Dona at the Old Town School, one hour a week, every Wednesday night. After his first Wednesday class, Phil came home, unpacked the Dusty Strings, screwed in the long leg, and balanced the dulcimer across his knees. He then proceeded to play not individual notes, but an entire song, “Soldier’s Joy.” I was amazed; he was ecstatic. That first night after class, he played “Soldier’s Joy” for an hour. Then, knowing himself well, he made the promise that he wouldn’t become compulsive about playing. “That time hasn’t come yet,” he replied. By the end of ten weeks, Phil knew that playing the hammer dulcimer was something he wanted to do for the rest of his life. Writing is something I feel compelled to do and intend to do all my life, so I knew how he felt and was very happy for him. At times he would come home from class with something besides a new song: he’d come home with a new pair of hammers. He subscribed to Dulcimer Player News, to Dirty Linen, and to Sing Out. He read the articles and the ads. He ordered tapes. He ordered CDs. And he ordered more hammers. “What are all these sticks?” I asked, pointing to a jar sprouting a bouquet of them. “Are you going to be compulsive about this?” I asked. Once Phil recognized that he wanted to play the dulcimer for life, it followed, as re and mi follow do, that he needed a dulcimer for life. But dulcimers are harder to choose than hammers, and he relegated the dulcimer decision to the background. For a while. As it was, he had to stow it overhead, but getting the Dusty Strings to California and back proved no problem. Early one Saturday we left Chicago, and late that evening in San Francisco Phil was practicing “South Wind” and “Rakes of Mallow,” the two songs Dona had given him to learn during the trip. During that vacation, he played in hotel rooms, on the balconies of inns overlooking vineyards, on benches along the Pacific, and on benches on public sidewalks, always attracting an audience and comments. One couple out for a moonlight stroll asked that he not stop playing. In Trinidad, California, a 14–year–old bicycling home from school parked his bike alongside the bench and wanted to know all about the instrument. A hippie couple stopped to listen. “Groovy,” they declared. Seattle, besides being the site of the 1994 Bouchercon, is the home of the Dusty Strings factory. While I attended mystery seminars and workshops, Phil visited Dusty Strings. Later that day, I met him at the factory and we continued to look and ask questions as he searched for the dulcimer–for–life. The next day, he made an appointment to visit dulcimer player Rick Fogel, who builds Whamdiddle dulcimers. We visited Rick in his basement workshop and listened to his dulcimer and talked to him at length. Both Phil and I loved the sound of the Whamdiddle, but Phil wasn’t sure if he knew enough about other dulcimers to commit to having Rick build him a Whamdiddle. “I hate to say this,” he said as we flew back to Chicago, “but I think we have to go to St. Louis when we get home.” “Why?” I asked. “Because the Midwest’s largest dulcimer store is there. I can play on all the different models I’m considering, and that will help me make up my mind.” We arrived back home on a Sunday. Six days later, we woke at 5:00 , ate breakfast, and drove to St. Louis, reaching Music Folk around 1:00. For the next five hours, dulcimer player and store owner Rick Thum answered Phil’s questions, played various dulcimers for us (giving us the “hidden dulcimer” treatment, in which we heard but did not see the instrument he was playing), allowed Phil to take two dulcimers down to a sound room and play them to his heart’s content, and was patient and understanding when Phil couldn’t make up his mind. As we drove north to Springfield, where we would visit friends and spend the night, Phil agonized over which dulcimer, exactly, was the one he wanted. The most important consideration was sound, but he was also a bit concerned with weight and size. We had dinner with our friends, spent time talking about dulcimers and other things, and got to our hotel after midnight. That evening, Phil called Rick Fogel in Seattle and ordered the Whamdiddle Model 4–0. Phil was cocky enough now to ask Rick to change his normal tuning pattern and give Phil’s dulcimer a low A. Then he sent in a deposit on the dulcimer … and ordered two pairs of hammers. Rick said the Whamdiddle would be ready in February. That meant at least four months more of renting the Dusty Strings, and Phil wondered if he should continue paying $45 a month without buying the dulcimer. So, after buying the Whamdiddle, Phil also bought the Dusty Strings and became the happy owner of two dulcimers. 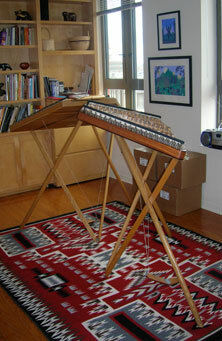 In our 990–square foot apartment, two dulcimers take up a lot of room, but I couldn’t really complain. Even though I own only one computer on which I do all my writing, I also own a typewriter, so I guess Phil and I were in harmony, more or less. One week later, Phil came home from work with a third dulcimer. According to Phil, he was innocently standing in the printing plant watching George, a pressman, use a T–wrench to make a press adjustment. “That’s something like tuning a dulcimer,” he observed. “What do you know about tuning dulcimers?” challenged George. “I play a hammer dulcimer,” declared Phil. “What do you know about it?” “I built a hammer dulcimer” George answered. So it transpired that George brought the dulcimer he had built in to work and Phil played it. George then gave the dulcimer to Phil. Although Phil tried to pay him for it, George would hear none of it: he wanted to give the dulcimer he had built to Phil. The dulcimer that George built is a 15/14, made of maple and mahogany. It’s quite beautiful. By this time, Phil owned two Whamdiddle dulcimer stands: one for standing, one for sitting. He put the Dusty Strings on one stand, the George on the other. He played one, then the other. Back and forth. He couldn’t decide which he liked better. That week, Phil wanted to take George’s dulcimer to show Dona during class. But he couldn’t carry two hammer dulcimers. So I went to class with him, my sole responsibility being to carry the second dulcimer. Dona said George’s dulcimer was beautiful and would make a great backup instrument in a band. Phil now owned three dulcimers … but he wasn’t compulsive. Dona used the advent of George’s dulcimer to encourage Phil to play backup in her square dance band. But Phil, though an advanced beginner, is still new to this, and he gets nervous playing in front of other people. Thanksgiving and Christmas and New Years approached. When my parents visited, Phil played for them. When guests came to dinner, he played for them. Although he was nervous and didn’t play as loosely as when we’re alone, the guests loved it. They had all kinds of questions about the instrument and about the songs. In January, we began a project we’d been dreading for years: remodeling the kitchen. Because we had no sink, no stove, no oven, no table, and no chairs, our friends took pity on us and invited us to dinner. One Saturday we dined at Bill and Beth’s. “Have Phil bring his dulcimer,” they said. After dinner Phil played for them, a little less nervous than before. We all had a great time. The next Saturday, Sharon and Steve had us over for dinner. Phil told me that he was taking his dulcimer. “But they didn’t ask you to bring your dulcimer!” I objected. He took it anyway. “What’s that?” they asked as he lugged the dulcimer and stand up their front stairs. It turned out to be fun. Luke, Sharon and Steve’s ten–year–old, brought out his violin and played some tunes, also.